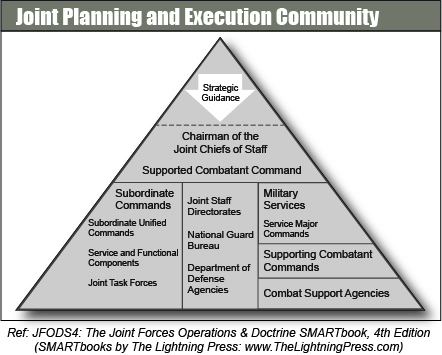 The headquarters, commands, and agencies involved in joint operation planning or committed to a joint operation are collectively termed the Joint Planning and Execution Community (JPEC). Although not a standing or regularly meeting entity, the JPEC consists of the CJCS and other members of the JCS, JS, the Services and their major commands, the CCMDs and their subordinate commands, and the CSAs. The supported CCDR has primary responsibility for all aspects of a task assigned by the GEF, the JSCP, or other joint operation planning directives. In the context of joint operation planning, the supported commander prepares plans and orders in response to requirements generated by the President or SecDef. Once approved by SecDef or the CJCS, the designated supporting commanders provide planning assistance, forces, or other resources to a supported commander. Supporting commanders provide forces, assistance, or other resources to a supported commander in accordance with the principles set forth in JP 1, Doctrine for the Armed Forces of the United States. Supporting commanders prepare supporting plans as required. A commander may be a supporting commander for one operation while being a supported commander for another. In the planning process, the President and SecDef issue policy, strategic guidance, and direction. The President, assisted by the NSC, also issues policy and strategic direction to guide the planning efforts of federal agencies that represent other instruments of national power. SecDef, with the advice and assistance of the CJCS, organizes the JPEC for joint operation planning by establishing appropriate command relationships among the CCDRs.